When you install a towbar to your car it is necessary to install an electric kit too. Electric kit ensures a safe flow of electric stream to the socket. Electric kit consists of wires, electric socket, a montage set and sometimes an electric module. Because of the fact that electric installations in some modern vehicles tend to be quite complicated, having a module in your electric kit is the safest solution. 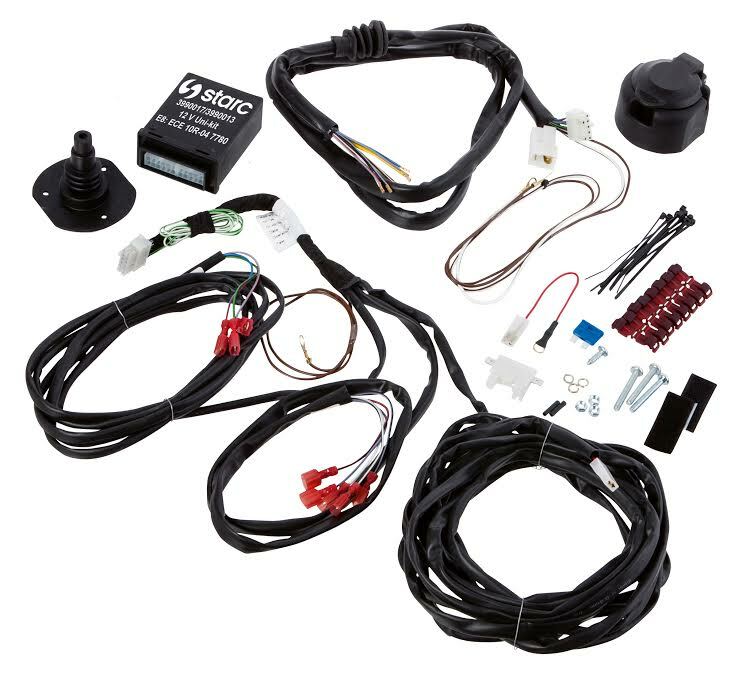 7-pin electric kit is the basic electric set that can be installed together with a towbar. It is designed for light trailers up to 750 kg without reversing light. In Poland 7-pin electric kits are still most popular ones while other European countries use 13-pin electric kits. Apart from basic 7 lights which are served by 7-pin electric kit, 13-pin electric kits also serve the reversing light. Additionally, these electric kits have some extra functions, as for instance current load or smart battery charging on the trailer. If you are going to buy an electric kit for your vehicle it is worth to choose more advanced 13-pin solution. As far as electric kits are concerned, the best choice for any car is a specific electric kit. Such electric kit is designed specifically for a given car model and is compatible with original electric kit that is used by authorized services. Specific electric kit ensures that all electronic functions of modern vehicles (as for instance ESP, TSP, PDC) will work flawlessly. Installation of such electric kit is very fast and safe. Original connectors make this process even more convenient. That is why specific electric kits are recommended by most car manufacturers and other automotive specialists. Universal electric kits are designed for those customers who want to have a cheaper electric solution. Appropriately installed universal electric kit will work failure-free. Although, the quality of such universal electric kit is an extremely important aspect. The wires need to have appropriate thickness and quick release plates also need to be of high quality. The electric socket should be made out of durable material and it should include a good quality seal. A basic 7-pin electric kit UNI7 that you can find in Martec offer meets all of these requirements. Other universal electric kits that you may find in Martec offer are UNI13 (simple 13-pin electric kit) with 8 or 12 wires and a huge variety of other universal electric kits with modules. Martec professionalists will help you in choice of optimal solution for your car. Contact us anytime!